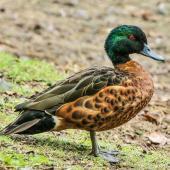 The chestnut teal is a small Australian duck that is occasionally seen in New Zealand. 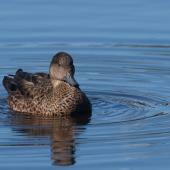 It is sexually dimorphic, with breeding males having similar plumage to male brown teal, and females looking very like grey teal. 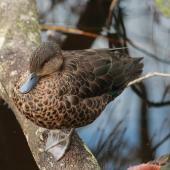 Most New Zealand sightings have been at coastal wetlands, particularly Manawatu Estuary. 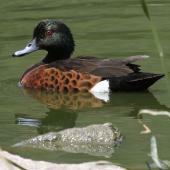 Chestnut teal sexes differ in plumage and size. 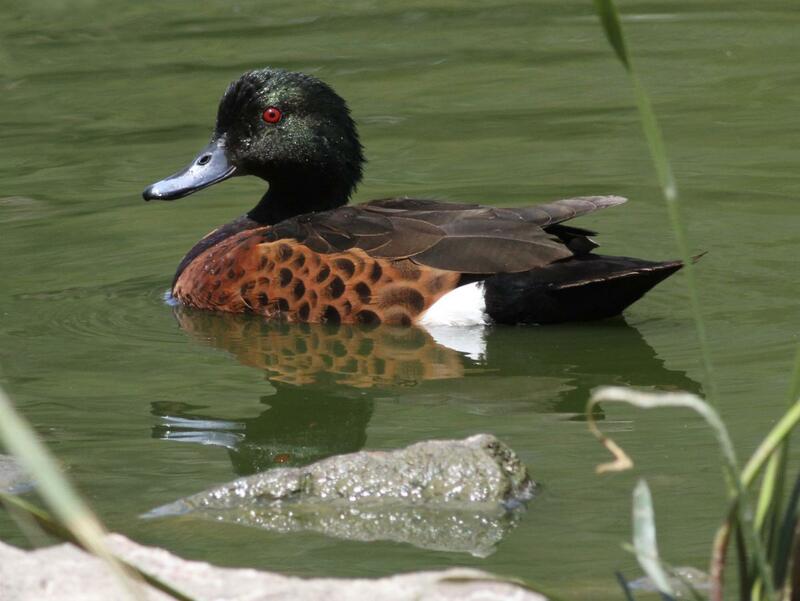 The male is a small dark duck with a green head and contrasting red eye, and chestnut flanks, breast and belly with a prominent white patch at the base of the tail. 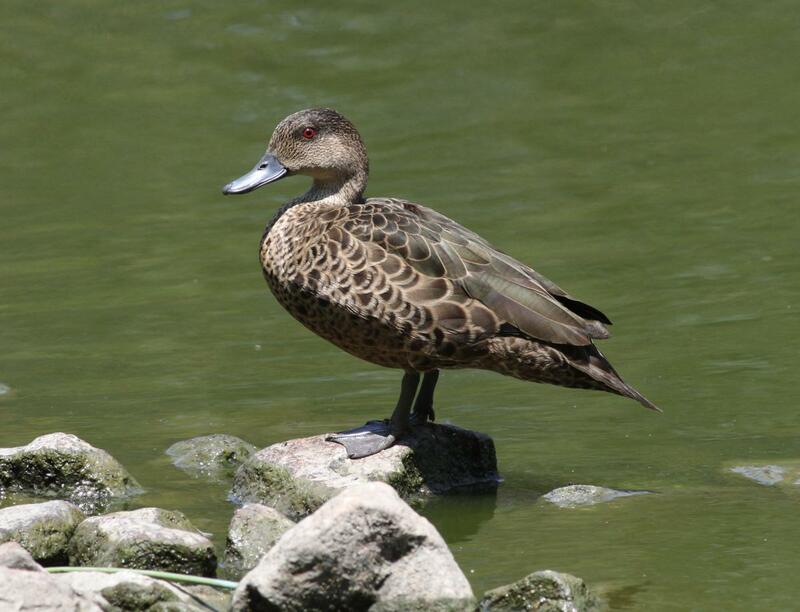 The female is smaller and uniformly brownish-grey, very similar to the grey teal but with a dark face and throat, and a red eye. The bill of both sexes is slate-grey. In flight, the upper wing of both sexes has a green speculum bordered by white stripes, the anterior one being broader and almost triangle-shaped. Their underwings are dark with a conspicuous white triangle. Voice: similar to grey teal. 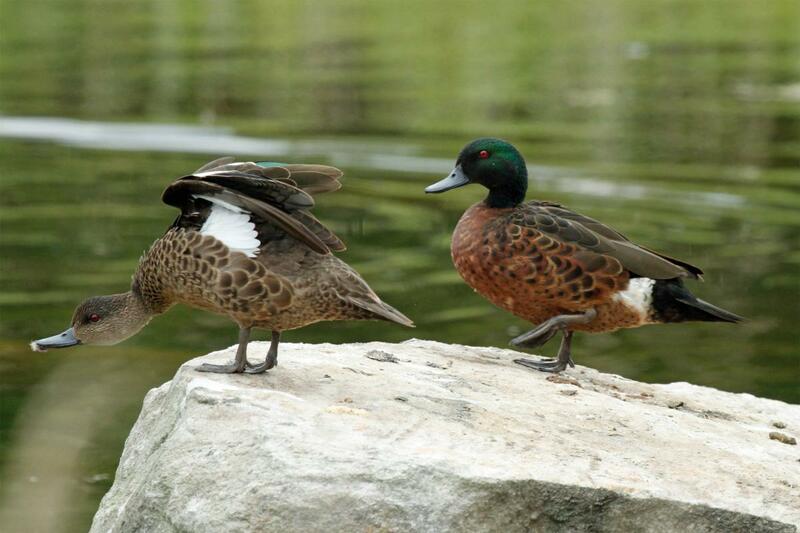 The main calls are the female’s high-pitched decrescendo quacking, and male’s whistle-like “burp”. 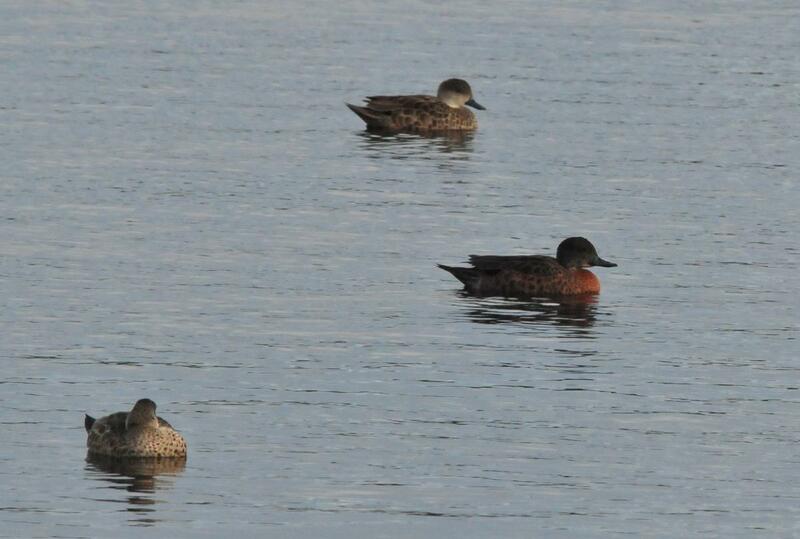 Similar species: the chestnut teal is similar to three other small duck species that are widespread on mainland New Zealand: Australasian shoveler, grey teal and brown teal. 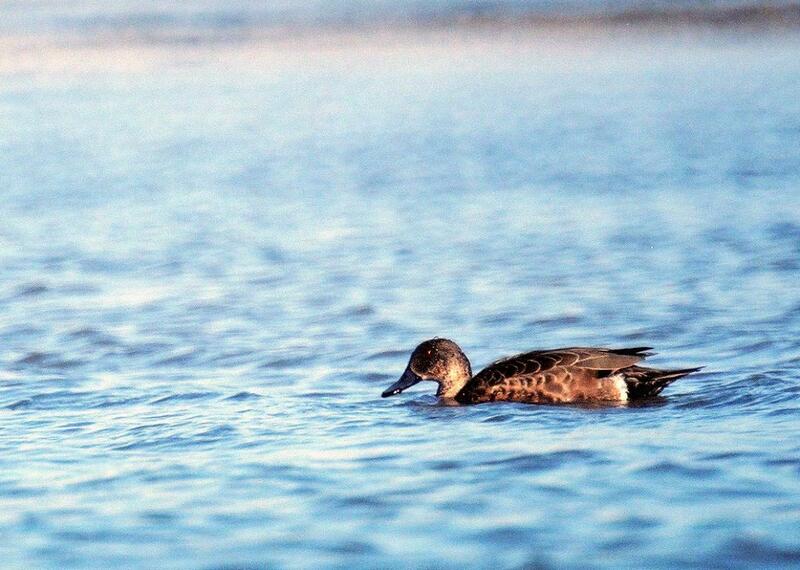 Immatures and females are similar to grey teal, but are darker and lack the pale throat. 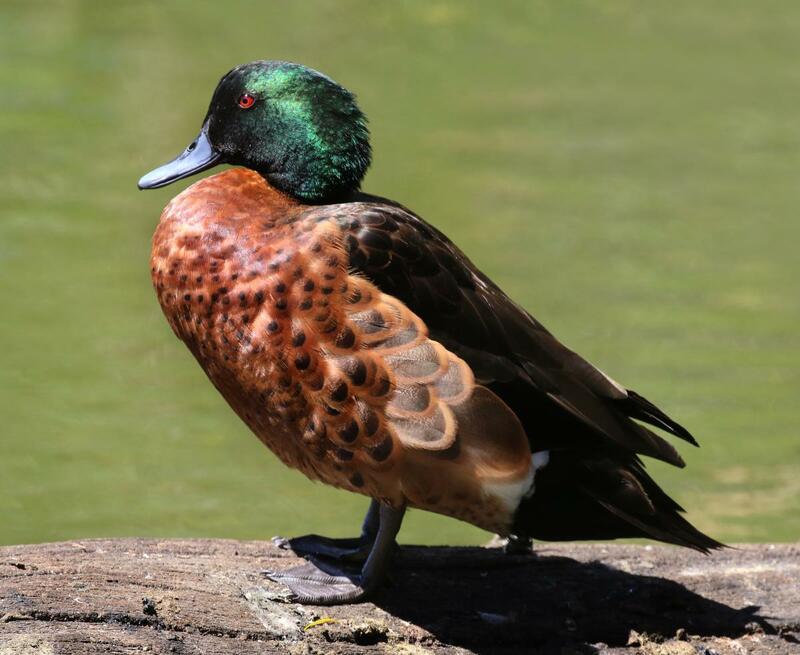 The male is similar to the shoveler in having a conspicuous white flank patch, but has a green (not blue-grey) head, and dark (not white) underwing. The chestnut teal differs from brown teal in having a red (not black) eye, a prominent white triangle on the upper wing, generally brighter chestnut underparts and a more conspicuously iridescent green head. 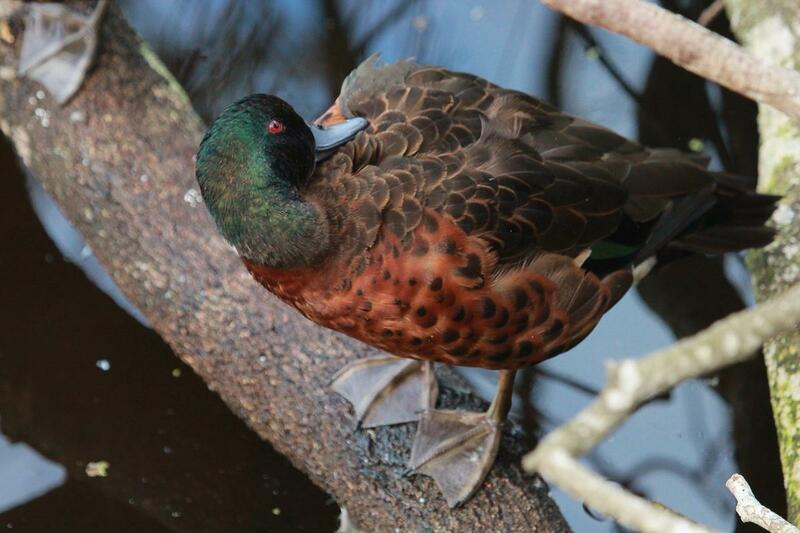 The chestnut teal has a disjunct distribution in Australia, occurring in south-east Australia and Tasmania, and in the south-western corner of Western Australia. 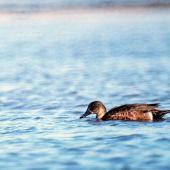 It is vagrant to elsewhere in Australia, New Guinea, Lord Howe Island and New Zealand. 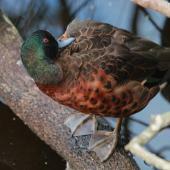 It is most often found in the lower reaches of rivers and in estuaries, and coastal lagoons and wetlands. 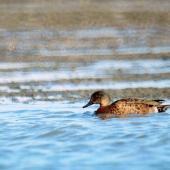 There are an estimated 1500-2000 chestnut teal in Western Australia, and 25-100,000 in south-east Australia and Tasmania. 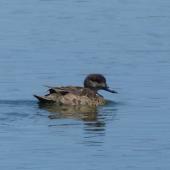 Chestnut teal were first detected in New Zealand when an immature male was seen at the Manawatu Estuary in June 1991. 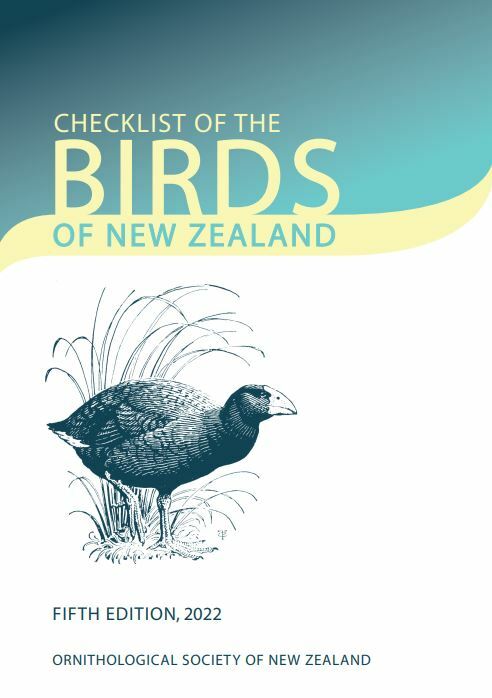 There were many subsequent sightings of up to 3 birds at Manawatu through to at least 2003; these may all have been of the same individuals. 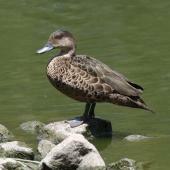 Subsequent New Zealand sightings have mainly been at coastal or estuarine sites, including Karitane, Otago (January 1993), Kowhai River mouth, Canterbury (August 1993), Clutha River, Balclutha (February 2003), Coatesville, Auckland (October 2003), Bromley oxidation ponds, Christchurch (March 2010), and Mangere water treatment ponds, Auckland (May 2010). 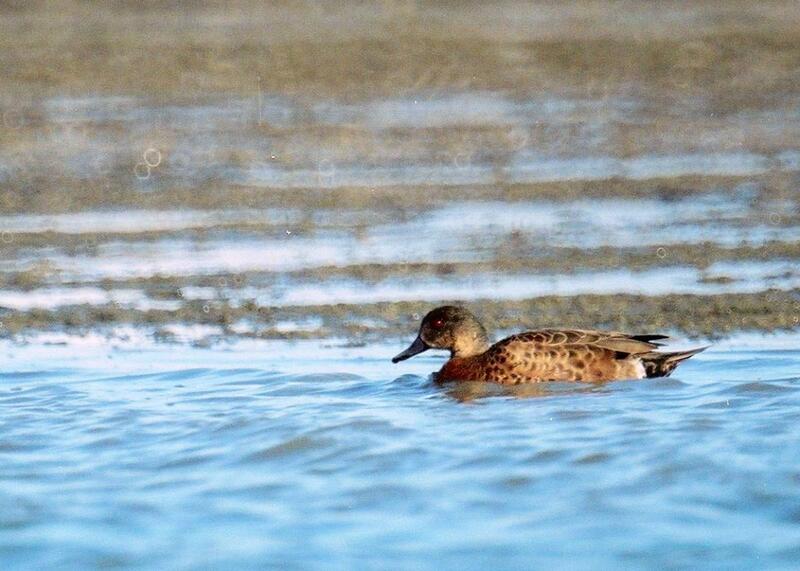 The chestnut teal is abundant in south-eastern Australia, and is a game species in Victoria and Tasmania. Pair bonds may be maintained year-round. 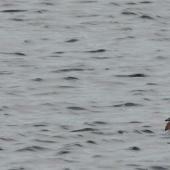 Pairs are well dispersed and territorial for breeding from September to December. 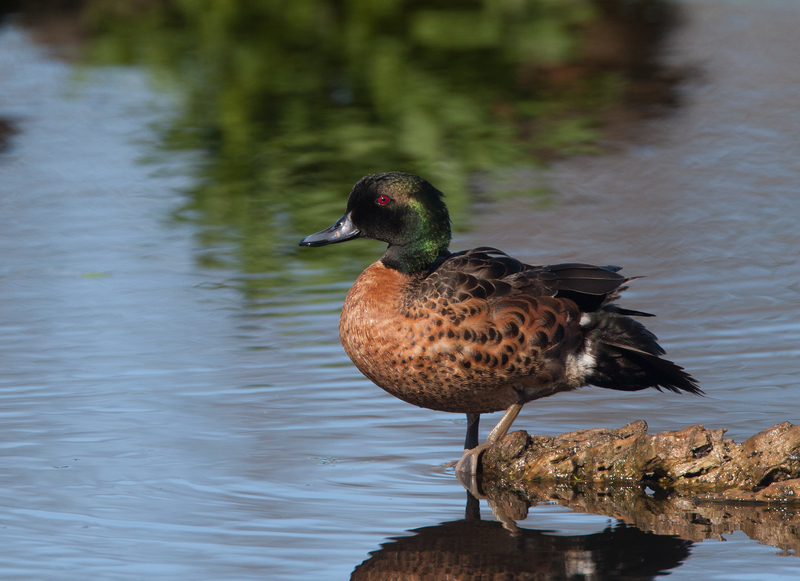 Nests are usually in tree holes, and chestnut teal take readily to artificial nest boxes. Clutches of 7-10 eggs are most common but egg dumping also occurs. 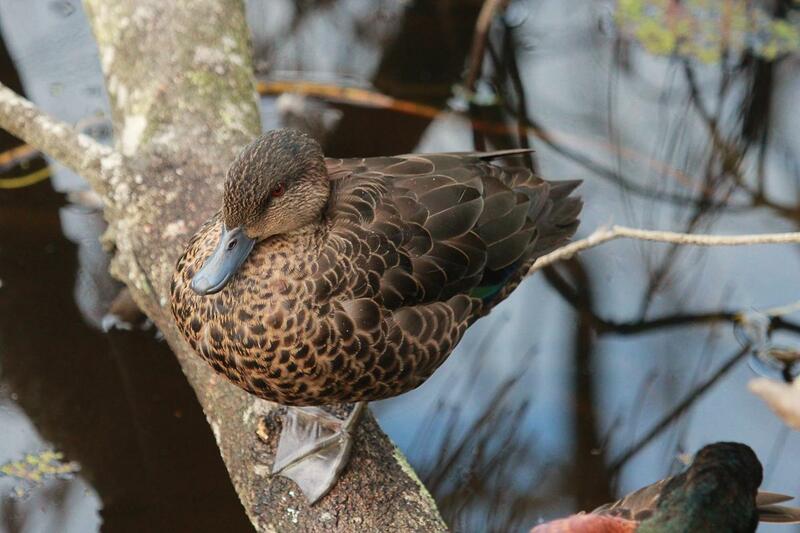 Incubation is by the female only, but both parents guard the ducklings for 50-60 days. 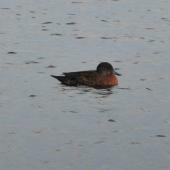 Occasionally females lay a second clutch before fledging and dispersal of the first brood. 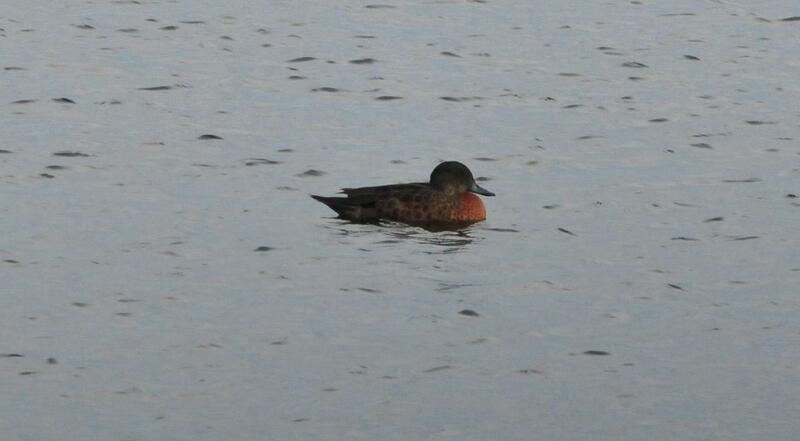 Chestnut teal are encountered in pairs during the breeding season, otherwise in small or large flocks. 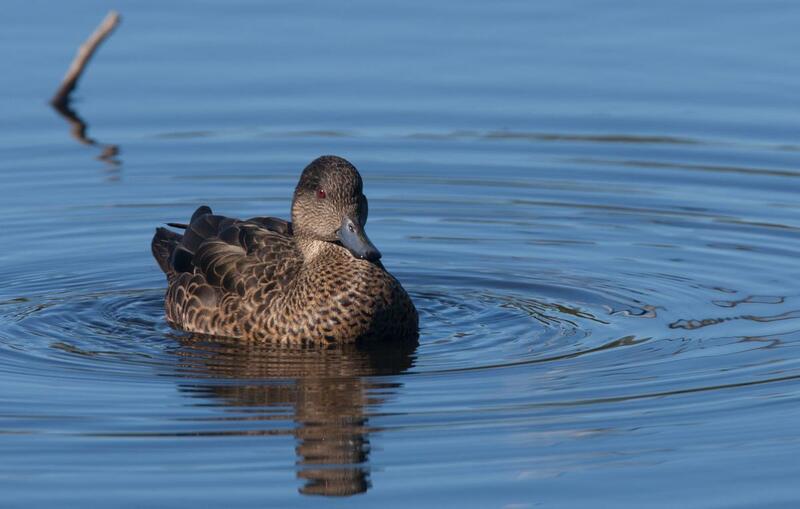 They are more sedentary than grey teal, and individual movements are generally limited to dispersal from breeding sites to local communal flock and feeding sites. 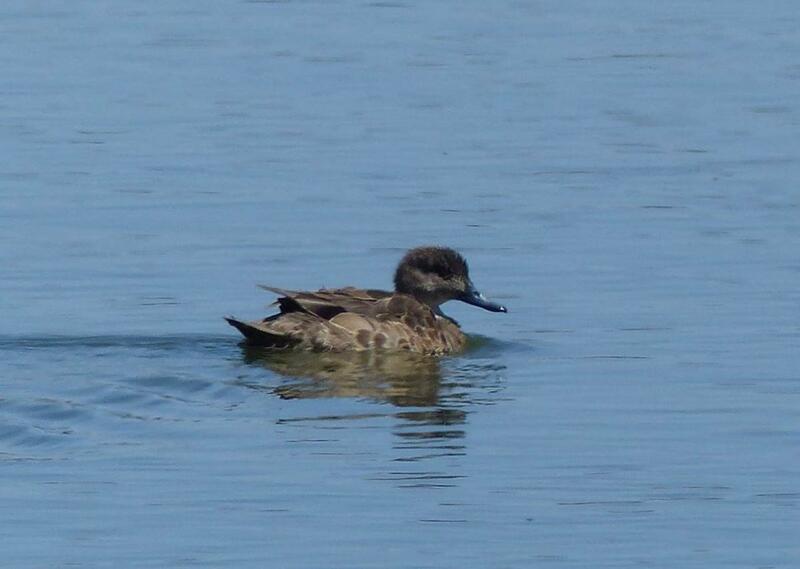 Chestnut teal mainly eat small invertebrates, especially when feeding in more saline environments. An extensive range of freshwater and estuarine invertebrates have been recorded. 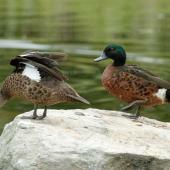 Plant foods include seeds and leaves of most wetland fringe and aquatic plants. Kear, J. (Ed.). 2005. Ducks, geese and swans. Vol 1.OxfordUniversity Press,Oxford,UK. Moore, J.; Moore, M. 1992. A chestnut teal at the Manawatu River estuary – a new bird for New Zealand. Notornis 39: 289-292. 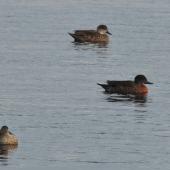 A small dark duck with a slate-grey bill, a green speculum bordered by white stripes, and dark underwings with a white triangle. 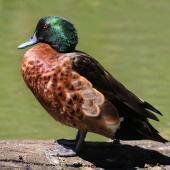 Males have an iridescent green head with red eyes, and chestnut flanks, breast and belly with a white patch at the base of the tail; females are brownish-grey with a dark face and throat.